The treadmill offers you the opportunity to walk indoors without braving dark mornings, cold weather or unfriendly terrain. Most treadmills have an incline option -- with home models going up to a 10 percent grade, standard commercial models going up to 15 percent grade and super-incline trainers reaching about a 30 percent grade. Walking on an incline offers multiple benefits whether you exercise to lose weight, improve aerobic capacity or build leg strength. Adding an incline significantly increases the calories you burn during your walk. For example, if you weigh 160-lbs. and walk at a 4.0 mph pace on no incline, you will burn approximately 145 calories in 30 minutes. 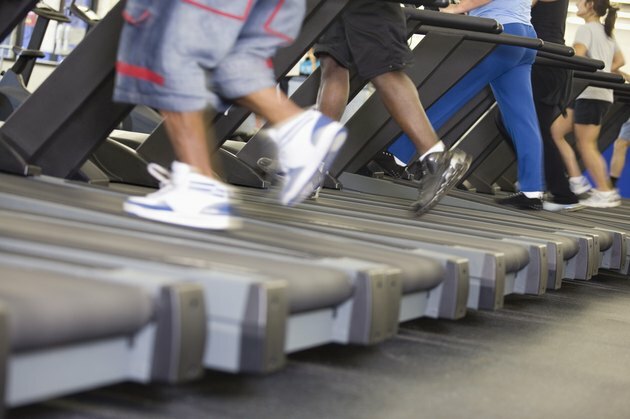 Raise the incline to a 5 percent grade and you will burn 243 calories in that half hour. Go up to a challenging 10 percent and burn 345 calories. Working at intensities of about 75 percent of your age-predicted maximal heart rate or higher helps improve cardiovascular fitness. Walking on an incline increases your heart rate, especially if you are relatively fit. For some people, the only way to increase heart rate on a treadmill is to speed up, which may be inappropriate for those with joint problems or injuries. Walking on an incline increases the workload, thus raising the heart rate without having to risk aggravation of injury by running. The body uses a greater percentage of fat for fuel when walking on an incline compared to walking on a flat surface. Freemotion Fitness notes that walking at 3 mph on a super-incline trainer raised to between 16 and 18 percent incline burns 70 percent more fat than running with no incline. Walking on an incline increases leg muscle activation. Incline treadmill walking activates the muscles of the calves, hamstrings and glutes more than walking on a 0 percent incline. Significant strength training benefits for the legs are experienced at inclines above 15 percent. Does an Inclined Treadmill Make You Gain Muscle? Does Running or Walking on an Incline Burn More Calories than Running or Walking on Flat Ground? Will Walking Build Muscle Mass or Will it Just Tone?